Fun & Inspiration 5 Bad Habits That Drain Your Energy & How To Stop Having Them! 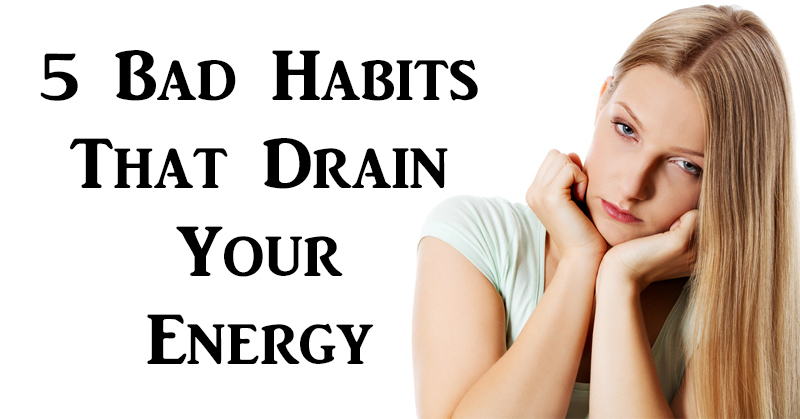 5 Bad Habits That Drain Your Energy & How To Stop Having Them! Toxic people have a way of sucking the life out of you. Even one night of hanging out with a toxic person can leave you feeling drained and full of negative energy. In order to live a positive and fulfilled life, you must cut out anyone who is toxic to you. These type of people will only bring you down and drain you of your positive energy. It’s important to surround yourself with friends who support you, motivate you and make you happy. It’s all too easy to leave the house a mess, especially when you’re in a hurry in the morning. You might leave with an unmade bed, clothes on the floor, dishes in the sink and a messy bathroom. Even if you have intentions of cleaning later, let’s face it. When you get home after a long day, the last thing you want to do is clean a messy house. Start waking up just a few minutes earlier in the morning to clean up before you leave, it will make a world of difference. Coming home to a clean and organized house will put you in a better mood and help relieve your stress, instead of draining you. It can be extremely difficult to get over something that brought you pain. Especially when it’s someone close to you who has hurt or betrayed you. Healing takes time, but making the decision to move on is the first step. Holding a grudge will only keep that pain with you. It will constantly be in the back of your mind, filling you with negative thoughts and feelings. As hard as it is to forgive and move on, it’s the best thing to do for your mental health. No one likes to pay bills, but most of us have them. Making them a priority can help balance your life and lower stress levels. Late bills can cause late payments, unwanted phone calls and extra anxiety. To keep your energy up and avoid added stress, pay your bills on time! Being sick, whether physically, mentally or emotionally, can drastically effect your energy. One of the most important things you can do for your mind and your body is to put your health first. Exercise regularly, eat a healthy and well-balanced diet, and take time to do things that make you happy. With a healthy mind, body and soul, you’ll be able to live a life full of happiness and positive energy.